Zombies are known for a lifeless look with a pale and rotting complexion. You can achieve this look with our Zombie Gray Cream Makeup. This makeup has the perfect shade of gray to match the look of frightening zombies. 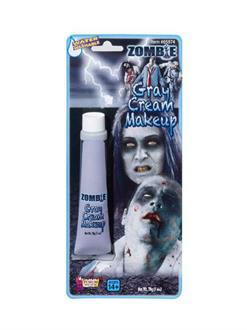 The Zombie Gray Cream Makeup is needed to get the perfect zombie look for your Halloween party. Don't forget to check out our fake blood capsules and other zombie accessories. Material: Water(aqua), Glyceryl Stearate, Mineral Oil (paraffinum Liquidum), Propylene Glycol, Stearic Acid, Cetyl Alcohol, Triethanolamine, Diethanolamine, Diazolidinyl Urea, Methylparaben, Propylparaben, May Contain [+/-]: Titanium Dioxide (ci 77891), Iron Oxides (ci 77499).